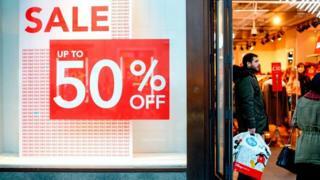 Retail sales bounced back sharply in January, rising by 1% on the previous month, official figures showed. The Office for National Statistics (ONS) said the amount of goods sold rose by 1%, after falling by 0.7% in December, with discounts in clothing helping to boost sales. Compared with a year ago, retail sales were 4.2% higher in January. That was the biggest annual rise since December 2016. The figures beat most economists' expectations. "Clothing stores saw strong sales, luring consumers with price reductions, with food sales also growing after a slight dip after Christmas," said ONS statistician Rhian Murphy. The ONS said clothing prices fell by the most since August 2016. The figures suggest that consumer spending may have picked up again after a lull following the summer's World Cup. The findings also echo those from the British Retail Consortium, which indicated that shops saw their fastest sales growth for seven months in January. Other recent data has shown wages picking up after years of stagnation and rising faster than inflation. Samuel Tombs, chief UK economist at Pantheon Macroeconomics, said: "January's jump in retail sales shows that most households have maintained a happy-go-lucky mentality, despite the fraught political situation. While consumers' confidence is down, this reflects rather fuzzy expectations that Brexit might be costly eventually." But he added that although low confidence would prompt consumers to hold back from buying cars, booking holidays and moving home, he thought the High Street would be protected.